HOW STRONG IS THE OPPOSITION? Who will be the next President of Tanzania? This is the question exciting the country at present. And the short answer is that nobody has the least idea at this stage. But the picture has been transformed following the dramatic entry of former Deputy Prime Minister Augustine Mrema and now Acting Chairman of the NCCR-Mageuzi opposition party into the fray. Tanzania’s first multi-party presidential and parliamentary elections will take place on October 29 1995. Voter registration will be from August 6 to September 4 and nominations of candidates must be completed before August 22. The campaign will begin officially on August 29. Potential candidates for the presidency have started campaigning already. But, with the new threat from a potentially strong opposition candidate (see below) the monolithic Chama Cha Mapinduzi (CCM), which has ruled Tanzania for the last 25 years, is faced with a formidable problem in finding a candidate who is not tainted with the corruption acknowledged to be widespread in Tanzanian society today. A growing number of CCM members have let it be known or are likely to let it be known shortly that they wish to be in the running for the top job – the Presidency – as President Mwinyi, who will shortly complete his second term of office, has to step down under the Constitution. The CCM is no longer the united group it once was as various factions look over the possible field of candidates and decide where to lend their support. Political analysts are trying hard to identify the eventual winner of the much prized CCM candidacy because the odds still are on the CCM candidate winning the election. MARK BOMANI, former Attorney-General and presently Chairman of the Broadcasting Commission. NJELU KASAKA MP, Deputy Minister for Agriculture and Livestock Development, the first person to announce that he will stand for president; he was not well known until last year when he led the ‘Group of 55’ MP’s pressing for a separate government for Tanganyika. EDWARD LOWASSA, Minister of Lands, Housing and Urban Development. JOHN MALECELA, former Prime Minister and still Vice-Chairman of the CCM but greatly weakened by Mwalimu Nyerere’s clear disapproval. SIMON MBILINYI, Managing Director, National Development Corporation. BENJAMIM MKAPA, Minister of Science and Technology. PIUS MSEKWA, Speaker of the House of Assembly, the second person to declare his candidacy and regarded as a strong contender. FRANCIS NYALALI, Chief Justice of Tanzania. SALIM AHMED SALIM, Secretary General of the OAU, has stated that he will not be standing but he might change his mind or at least stand for the Zanzibar presidency. Little has been said so far on the issues to be debated during the election but Mr Msekwa has indicated support for a separate Tanganyika government and a return to the leadership code of the Arusha Declaration; both he and Mr Kasaka have emphasised good uncorrupt government. The nation was stunned and the CCM severely shaken on February 24 when they were told that President Mwinyi had dismissed Labour and Youth Development Minister and former Home Affairs Minister Augustine Mrema for indiscipline. The event which triggered off the dispute between Mr Mrema and the President was a debate in the National Assembly in Dodoma following the publication of a Parliamentary Committee Report into the affairs of a prominent non-citizen businessman and owner of several farms, Mr V G Chavda – a case which has been hitting the headlines in the press for many months. The Committee recommended the arrest and prosecution of Mr Chavda over a multi-million shilling foreign exchange scandal. ‘The Committee alleged that Mr Chavda had misused Shs 916 million in debt conversion funds lent to him by the government, to develop four sisal estates he owned. Some ministers felt that he was innocent but on February 11 the government declared him a prohibited immigrant. Three days later the High Court restrained the government from deporting him. Mr Mrema used the occasion to castigate the government. His conscience would haunt him, he said it he went along with the government line on Chavda. President Mwinyi therefore sacked him for failing to observe the rule of collective government responsibility. Shortly after, Mr Mrema announced that, as he was being ‘harassed’ by the ruling party (the CCM) , he was resigning from it and had decided to join the opposition National Convention for Constitution and Reform – Mageuzi (Change) NCCR-Mageuzi whose Chairman Mr Mabere Marando promptly resigned to make way for him. Then began a triumphal procession. In Dodoma Mr Mrema was carried shoulder high by excited crowds and some 3,000 people signed up for the NCCR-Mageuzi. When he reached his home town, Moshi, police had to use tear gas to control the crowds and shops closed as thousands greeted him all the way from Kilimanjaro airport to the town. In Dar es Salaam he addressed what was described as one of the biggest meetings ever held in the city. At the NCCR party headquarters officials were selling membership cards until late in the night making nearby roads impassable. It is assumed that he will soon declare his bid for the presidency and there are indications that several other opposition parties might support him. Mwalimu Nyerere addressed the Dar es Salaam Press Club at the height of the Mrema drama. He reiterated at length his views on the sacredness of the Constitution and the vital importance of preservation of the Union. But Mwalimu was careful not to indicate which candidate he supported. It was essential he said first to examine the issues facing the electorate. The name Mrema evokes strong feelings. He is not considered to be an intellectual but he has charisma; he is a hero to the masses, and to the underprivileged, but is regarded with some distrust by many of the thinking classes because of his unpredictable behaviour and the way he sometimes tends to take action which might be considered to be stretching the law. He is very hard working and diligent in his search for injustice. But, having detected it, he tends to make very rapid judgements often without giving full thought to the probable consequences. His reactions during the Dodoma drama are interesting. First, he is reported to have said that he was not going to quit the CCM party. Two days later he left it. Then he said he was leaving but still loved the party very much. Later he was attacking it with all barrels blazing; the party was guilty of ‘corruption, negligence and theft.’ He also said to have declared that he was not going to join another political party. Then he joined NCCR-Mageuzi. In cabinet he often irritated fellow ministers by interfering in their portfolios. His four-year crusade against corruption however has made him immensely popular. But the only people he managed to catch for corrupt practices seem to have been lower level managers and employees. Mr Mrema is popular amongst women as he has declared war against wife beaters and husbands who neglect their families. In Moshi it was said that marriages were in danger as women flocked to join NCCR-Mageuzi while the men stayed with CCM. He has frequently caused panic in business circles as he demands action within so many days on improving pay and conditions of workers. He was initially on the side of the petty traders, a large number of whom are operating in Dar es Salaam. On December 18 last year Mr Mrema assured a group of them in Kariakoo that they would not be forced out of the city centre as long as they obeyed the law. On February 16 however, the government drove them away from the market area and there was a riot which had to be quelled by the police. A revealing analysis conducted by the Danish aid agency DANIDA and reported in the Business Times (January 20) indicated that in the most recent test of voter opinion – the local government elections held late last year the opposition parties did very much better than at first appeared. The full results were not published. Of the 2,411 wards on the mainland, contested elections were held in 1,226 wards while in the remaining 1,185 CCM candidates were elected unopposed. DANIDA was unable to obtain data from the Kigoma (where the opposition scored well), Tanga, Rukwa, Lindi and Singida regions but it was able to study 537 of the contested wards in the other regions. Because Tanzania has opted for a ‘first-past-the-post’ or ‘winner takes all’ and not a proportional representation system of elections the results examined showed that the opposition parties won over a quarter of the vote but gained only 3% of the seats. In Mara Region the opposition got 36% of the votes. Thus, although the opposition parties fought against each other, obtained little or no publicity on Radio Tanzania and had very limited funds, they did garner, on a 50% voter turnout, a surprisingly large number of supporters. If a system of proportional representation were in effect (something which would have the support of many including the Chairman of the National Electoral Commission, Justice Lewis Makame) and the opposition were to unite, now that it has a credible presidential candidate, it could do very well in the next elections. The CCM has had a number of other setbacks recently. The Court of Appeal ruled that the successful CCM candidate in the February 14, 1994 Kigoma by-election, Mr Azim Premji, was not a Tanzanian citizen and upheld an earlier High Court decision annulling the results of the by-election. CCM leaders (including Mr Mrema) had intimidated voters, the Judge said, the counting of votes had not been fair and Radio Tanzania had campaigned for the CCM. Amidst strong protests from the opposition, the National Electoral Commission subsequently stated that a new by-election could not be held this year on the grounds that it was time-barred – it had to be held six months before the general election and this was no longer possible. Then, after a long court case, the election last year of the CCM Mayor of Dar es Salaam, said to be a close collaborator of President Mwinyi, was declared nul and void. The Swahili newspaper ‘Heko’ carried out an opinion poll in Dar es Salaam in January and found that Christopher Mtikila, the firebrand leader of the unregistered Democratic Party remained the most popular politician (with 41% of the votes); Mr Njelu Kasaka came second (18%). The best contender to succeed President Mwinyi was said to be Lands Minister Edward Lowassa (22%) followed by businessman Reginald Mengi. Former President Julius Nyerere was very much more popular (77%) than President Mwinyi (23%). Former Finance Minister Kighoma Malima was said to have been voted the most untrustworthy politician. Mr Justice Makame has indicated the National Electoral Commission’s views on observers for the October elections. He said, at a three-day seminar on multi-party elections, in late January: “We have nothing to hide so we do not seek to stop any observers, local or international, from carrying out their assignments. For reasons which are obvious – we would not know where to stop – we do not take the initiative of inviting any observer …. provided that observers do not seek to influence the trend and pervert the process, there is no harm in having people distant enough from the wood to be able to see the trees … Observers should be in place well before the election day and they should be conversant with our rules to be able to gauge properly what is going on. Their presence would promote credibility in the electoral process to some people …. foreign observers could usefully operate with local observers”. In the last issue of TA the problem of the constitutional position of the Vice-Presidency was outlined. Subsequently Parliament passed an 11th Amendment to the Constitution which deprived the Zanzibar President of his automatic right to occupy the position of Vice-President in the Union Government; it was accepted however that he/she would be entitled to a senior post in the Union cabinet. The reason for the change, which House Speaker Pius Msekwa has been vigorously defending, was the fear that, under multi-partyism, it would be possible for a Vice-President to be elected who was not in the same party as the elected President. But Zanzibar was unhappy with the amendment and remains very unhappy. One party leader has said that if elected their party’s president would not sit in the Union cabinet. The Law society pointed out that the Amendment conflicted with the 1964 Articles of the Union. To make the change there would have had to have been a two thirds majority of all mainland and Zanzibar MP’s. If challenged in court, there could be a constitutional crisis. Surprisingly, on the same day (January 20) it was announced that President Mwinyi had signed the Constitutional Amendment a few days earlier! As this issue went to press the government was promising a Bill in Parliament in April which would clarify the status and role of the Zanzibar President in Union affairs. The isles’ main opposition party CUF has made it clear that it opposes the 11th Amendment. The National Assembly also rejected an earlier proposal (TA No 50) that 20 seats should be reserved in the National Assembly for persons to be nominated by parties achieving a certain proportion of the votes in an election. My reaction on reading the Tanzanian part of the recent book ‘No Man’s Land: An Investigative Journey through Kenya and Tanzania’ by George Monbiot (Macmillan. £17.99) was to want to know more about the latest situation in the Barabaig country of Northern Tanzania, where a large Canadian-supported wheat scheme (Described in Tanzanian Affairs issue No 24, May 1986 – Editor) has been steeped in controversy for many years. I did some research. I spoke to Charles Lane of the International Institute for Environment and Development in London, to an official of the managers of the project – the National Agricultural and Food Company (NAFCO) in Tanzania and also to officials of CIDA the Canadian International Development Agency) in Hull, Quebec Province. But first, about the book itself. George Monbiot’s earlier book ‘Poisoned Arrows’ exposed the plight of the people of Irian Jaya in Indonesia. For this he received a life sentence in absentia. He then wrote ‘Amazon Watershed’ about tribal life in Brazil. Now he has brought to our attention the plight of pastoral tribes in Kenya and Tanzania. To do this he spent some time living among them. He encountered much hardship and many dangers but found friendship and people as human as we are. In fact, once again, a book about East Africa reminds us who we really are: ancestors of the first travelling people like those whose footsteps are preserved in Olduvai Gorge. ‘Humankind was born on the road. Our brains, our physique, our emotional identity, are those of the migrant. The restlessness, which in one corrupted form or another, is felt by every human being on earth, is incurable, for it is fundamental to our nature’. Writing like this, in its widest sense, helps us to live together with more understanding so has something to give to all its readers. Monbiot visited Hanang District in Tanzania in 1991 and 1992 and met some of the Barabaig people and also Canadian and Tanzanian officials concerned with the 102,000 acre wheat farms. This chapter of the book usefully gives the history of the project including some of the scandalous details of the treatment of the Barabaig. It does not make pleasant reading. CIDA has serious reservations about some of what is written: ‘The chapter, which is written in pseudo-journalistic style, is filled with innuendos and misrepresentations. Mr Henckroth flatly denies many of the quotes attributed to him. ‘The author appears to be following his own particular agenda which does not include accurate reporting’. However, Tanzania and also Canada have now faced up to the fact that there was a failure on the part of the original planners to give any consideration at all to the 40,000 Barabaig who depended on the land concerned for their survival. It is to be hoped that this story could not be repeated in the world of today. No doubt, at the time, Canada’s proposal seemed like manna from heaven to the Government of Tanzania but our understanding of development has matured since 1970 and human rights matter more, though not enough, particularly in the building up of democracy. Tanzania eventually set up a lay commission headed by Appeal Court Judge Robert Kisanga to look into the problems of the Barabaig. In its 1993 report the commission made recommendations for the continued existence of the wheat farms and the Barabaig together. Some changes of staff were made on NAFCO’s side and the District Commissioner for Hanang was replaced. The Barabaig were advised to organise themselves to take a full part in discussions at district level and this they have done. NAFCO’s policy now is to help construct water points and to provide proper routes for the cattle of the Barabaig; to allow the people to visit their sacred burial sites; to stop harassing them whenever they are seen trespassing and to settle disputes amicably. The Ministry of Agriculture was recommended to update its guidelines on Hanang District and increase its extension services. CIDA, for its part, is contributing Canadian $4.5 million towards the implementation of the Kisanga Report. Of this sum, C$700,OOO have already been provided for photomapping the area for the purpose of confirming land use and its registration. Al though CIDA is no longer involved with the wheat farms, since July 1993, they regard them as ‘of strategic importance to the domestic food security of Tanzania’. In 1994 34,430 tonnes of wheat were produced but this was not a good year due to drought. An average 40,000 tonne crop would produce 180 million loaves of bread. CIDA conducted a mission to Tanzania in January 1995 in order to produce ‘an updated social and economic profile of the Hanang District’. A social and community development project is now being drawn up. I hope that ‘No Man’s Land’ will be read by many people for the light it throws on the plight of pastoral people today: most of it is highly readable, well-written with humour and understanding, even though some of it, notably the chapter about the Barabaig, is quite distressing. Tanzania’s new Minister of Finance Mr Jakaya Kikwete made a good impression at the crucial Consultative Group (donors) meeting in Paris on February 27-28. Donors were impressed by the actions he had taken to improve tax collection. According to the ‘East African’ he returned triumphantly to Dar es Salaam bearing a promise of $1 billion in new commitments of foreign aid for 1995-96. 20-25% would go to balance of payments and the rest to finance development. Mr Kikwete said in an interview that the November disaster (TA No 50) had come as a real shock to the government. He understood why donors had felt the need to let off steam ON revenue and corruption issues and admitted that some Shs 70 billion ($140 million) worth of tax revenues had not been collected last year. $40 million of that was tax evasion and $100 million was illegal tax exemptions. The Controller and Auditor General had completed work on tax evasion by 20 major importers and found 12 whose collective tax evasion amounted to Shs 17.4 billion ($31 million) of which tax evasion had amounted to Shs 4.8 billion ($8.8 million). He named the companies involved. Since December, nine of the companies had cleared their debts leaving arrears of only Shs 2.3 billion ($ 4.3 million). The investigation had revealed serious institutional weaknesses in the Customs Department and Treasury and negligence and dishonesty among some public officials had been confirmed. Measures being taken to recover funds included the arrest of four businessmen, impounding properties and auctioning them, closing some bonded warehouses (the number would be reduced from 177 to 65) and better control of transit trade with neighbouring countries. Mr Kikwete announced that Tanzania was reviewing tax exemptions offered to attract investment In tourism, agriculture and industry, both to determine who had used them illegally and to limit those it would offer in future. Capital goods would remain exempt but raw materials and spare parts would not, because some investors had been reselling them within the country. The Minister also announced that the Government had stopped all discretionary tax exemptions given by the Minister of Finance. Donors said that they wanted their relationship with the Tanzania government to ‘get back on track’. The World Bank’s Francis Colaco said that the donors were ‘reasonably satisfied’ on the tax front but that recovery of arrears had not been ‘as full as had been hoped’. An informal meeting is likely to take place in the summer to take stock of the progress resulting from measures agreed in Paris. In the agenda of the meeting there had been one notable omission, the heavy burden imposed by the servicing and redemption of foreign debt. However, this subject, though of critical importance to Tanzania, lies in the domain of another international forum, the Paris Club. 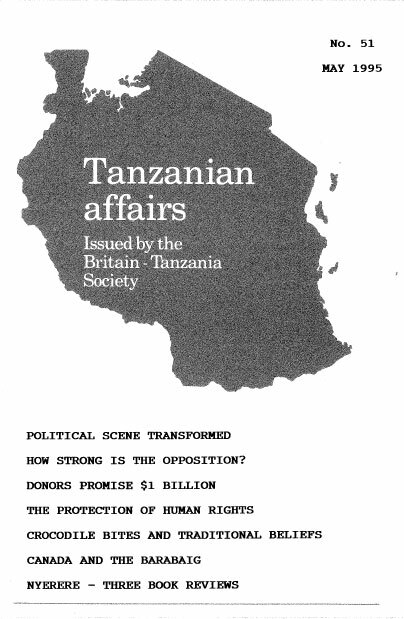 Some information on measures taken to reduce the debt burden was given in the September 1993 issue of the Bulletin of Tanzanian Affairs. The Consultative Group meeting took place under the shadow of the mismanagement and corruption recently disclosed by the President which had gravely affected revenues and led to an increased budget deficit and consequent rise in inflation. The meeting appears to have had some effect towards a restoration of confidence, though it is clear that the position will be closely watched and that a continuation of aid flows will depend on future integrity. The final communique recorded the commitment of delegates to external assistance to Tanzania and, provided that strong measures were completed to deal with tax exemptions and evasions, that the budget was brought into balance without borrowing from the bank and that certain structural reforms were accelerated, particularly, it is assumed, in respect of the banking system, new commitments for 1995/96 could reach at least $1 billion. Whether this goal is attainable will clearly depend on the absence of external shocks to the economy in the near future. The President’s original response to the crisis had been cabinet changes (TA No. 50) and these have already resulted in a more effective tax collection. It now remains to be seen whether the new government team will be able to address itself to the country’s formidable economic problems and to bring inflation down to single figures by the time of the next regular meeting of the Consultative Group in 1996. There is indeed no single reform more important than the reduction of inflation to a level at least as low as in Europe. Inflation is the most important single cause of impoverishment. By depreciating the value of money rewards, inflation creates the temptation of corruption. The extension of education and health services, and even the proper maintenance of the existing provision, is well nigh impossible in the paralysing grip of inflation. Inflation damages confidence and limits the flow of investment capital from abroad. The task of exporters and economic planners is greatly complicated and impeded by the need to take account of domestic inflation. It follows that the conquest of inflation is an essential precursor to significant progress in many aspects of the economy. In 1980 the campaign for universal primary education (UPE) had resulted in an enrolment in primary schools of over 90% of the appropriate age group, but sadly this remarkable achievement was not maintained and by 1980 enrolment had fallen to about 74%. The main cause of this retrogression was the high rate of population growth, the increase in the number of children in the eligible age group by about a third and the failure of available resources to expand in the same ratio. The health services have likewise been suffering severely from a lack of resources. modest reduction of the trend may be possible by increasing the share of resources for health and education by reallocation and economies but any substantial progress must await the conquest of inflation and the emergence of a budget surplus. One prudential step taken by the government is the pruning of the capital development programme in recognition of the fact that capital projects normally lead to additional recurrent expenditure for operation and maintenance, some or all of which may fall as a charge on the national budget. It seems likely that in the past inadequate attention to the recurrent cost consequences of capital development may have led to the overloading of the capital development programme, leading to the neglect of maintenance and increasing Tanzania’s external debt problems. This is a matter over which donors may have been less than helpful. The tasks before the new government team are truly formidable. One gratuitous obstacle to fiscal balance has been caused by drought in the regions supplying hydro-electricity to the national grid, leading to load shedding. The shortage of water for the generators in these areas is attributable not only to natural causes, but has been exacerbated by the diversion upstream of water for irrigation. About 75% of Tanzania’s installed generating capacity is from hydro-electric sources, the remainder from diesel powered generators. Before 1992 most of the thermal generators remained in reserve and 95% of power was taken from hydroelectric sources. But severe drought conditions in 1992 led to a resumption of diesel generation to about 18% of the total. TANESCO, the electric power company, reacted to the situation by installing a 36MW gas turbine generator at Dar es Salaam and by rehabilitating diesel generators connected to the grid. Owing to the continued shortage of water for the generating plant, however, these measures proved insufficient and TANESCO was forced to institute load shedding in 1994 and again in 1995. Load shedding is a disaster for industry and for the economy as a whole. It has seriously adverse effects on Government revenues and damages confidence among potential investors. For the short run the government has started an emergency power project (See Business News – Editor) but in the medium term, plans are in train for the diversification of power sources by the installation of gas fired generators at Songo Songo using natural reserves of gas, and a similar gas-fired installation at Mnazi bay. A power link with Zambia is also being considered. But these additions to capacity, necessary in any case in the face of rising demand, will take several years to materialise. Another serious burden on the budget is the restoration of the environmental damage caused by the influx of refugees from Rwanda (TA No 50). Whether in the face of these obligations and difficulties the Government can successfully restore its finances to stability within the next ten months remains to be seen. In April Parliament was scheduled to enact a Code of Conduct for Leaders and it is hoped that this will set the tone for public affairs. The mastery of corruption will only finally be achieved when inflation has been brought under control and money rewards have been stabilised at a reasonable level. But the recent public exposure of corruption will, it is hoped, have had a cleansing effect and have provided the new administration with a springboard from which to bring future dishonest dealings under control. Bank of Tanzania Governor Idris Rashid announced on April 2 that the Bank of Tanzania had taken over the operations of the Meridien BIAO Bank. Its Board of Management had been suspended and the Bank of Tanzania’s advisor John Montgomery had been appointed the new manager. ‘The development followed the earlier take over by central banks of the Meridien Banks in Kenya (March 14) and Zambia (March 28). ‘The Tanzanian bank’s foreign exchange exposure amounted to Shs 17 billion ( US$ 30 million) which had apparently been transferred abroad to support other loss making branches. It was later announced that Tanzania might sue the Directors and management of the Meridien Bank if they fail to return the $30 million. Mr Rashid assured the public that the Bank would remain in operation and there was no need for panic as the measures taken were aimed at safeguarding macro-economic stability and protecting the interest of depositors. Negotiations were under way with local and foreign firms interested in buying the bank. Meridien BIAO was the first private international bank to be licensed to conduct business in Tanzania two years ago when banking restrictions were lifted. It soon became the third largest bank in Tanzania after the National Bank of Commerce and the now privatised cooperative and Rural Development Bank. It had 30% of the total business. THE LAW has a vital role to play in the current transformation of government and politics in Tanzania, as Chief Justice Nyalali demonstrated in his impressive survey reported in the last issue of Tanzanian Affairs: as Chairman of the Presidential Commission which recommended ‘multipartyism’ he identified among the first essentials for a true democracy an environment of respect for the Rule of Law and for Human Rights. The Bill of Rights adopted in Tanzania by constitutional amendment in 1984 came into effect in 1987. The Nyalali Commission itself listed no less than 40 oppressive laws which violated the Constitution (many of them laws of Zanzibar); the expectation, yet to be fulfilled in most cases, was that these laws would be repealed, or suitably amended. Meanwhile Tanzanian judges have given many bold and thoughtful judgements over the past six years, often overturning laws which infringed human rights (most of them reported in the international series Law reports of the Commonwealth). In the first case under the Bill of Rights Mr Justice Mwalusanya in 1988 struck down the Deportation Ordinance, a colonial legacy dating from 1921, which authorised the ‘rustification’ of individuals with no requirement for fair trial or hearing; Parliament responded strangely in 1991 by purporting to amend this septuagenarian Act which the court had declared to be void! 3) in applying the Bill of Rights the courts can take account of the African Charter of Human and Peoples’ Rights 1981 signed by Tanzania in 1982. The Bill of Rights prevails not only over statute law but also over customary laws. Holoria Pastory, an elderly lady, inherited some clan land in Muleba District, Kagera Region, under her father’s will and sold it for Shs 300,000. Her nephew disputed the sale, citing a rule of Haya customary law that a woman cannot sell inherited clan land. The District Magistrate (reversing the Primary Court) held that under the Bill of Rights women had the same rights as men; the appeal came before Judge Mwalusanya, who, in a judgement quoting sources as diverse as Religio Medici and the Beggars Opera, rejected it, upholding the sale. The Bill of Rights guarantees access to the courts to settle disputes. A case of wide general importance (Kukutia Ole Pumbun) concerned a rule enacted in 1967 that a lawsuit against the government could not be started without first obtaining the consent of the Attorney General (a rule not unique to Tanzania). In 1993 the Court of Appeal held the rule was invalid because it violated the right of unimpeded access to the courts: although individual rights must be balanced against the collective rights of society, any derogation from basic rights must meet two conditions: the law must not be arbitrary and the limitation imposed on rights must be no more than are reasonably necessary to achieve a legitimate purpose. Land rights are obviously vital to most Tanzanians. In the Akonaay case a father and son by court order in 1987 recovered land in Mbulu District which had been taken from them during ‘Operation vijiji’ in the 1970’s. Then in 1992 an Act of Parliament purported to extinguish all customary law rights acquired before ‘operation Vijiji’ in ‘established villages’. The landowners brought a new case, challenging the validity of this Act. In 1993 Mrs Justice Munuo at Arusha held that the Act was void for violating several basic rights – the right to own property (subject to lawful acquisition and payment of compensation), freedom from discrimination and the right of access to the courts. In deciding the state’s appeal, the Chief Justice in the Court of Appeal examined the history of land law in Tanzania from the start of British rule, recognising that it was crucial, for a better understanding of the present, to understand the past (without living in it). The court noted the persistence of the underlying principle of protecting customary rights in land, held that such rights are property rights which the Constitution protects and identified ‘the Nyerere Doctrine of Land Value’ reflecting the value added to land by clearing and working it (citing Nyerere’s Freedom and unity 1966). However, the court allowed the appeal in part, because the customary rights in question had been effectively extinguished by legislation of 1987, before the Bill of Rights, which is not retrospective, became enforceable. Therefore the 1992 Act, which the court aptly termed ‘draconian legislation’, was not so much invalid as superfluous. The most dramatic decision on the Bill of Rights was the scholarly, wide-ranging judgement of Mr Justice Mwalusanya, at a murder trial in Dodoma in June 1994, that the death penalty is unconstitutional as a cruel, inhuman and degrading punishment; convicting the accused Mbushuu and Sangula of murder, he sentenced them to life imprisonment. However, in January 1995 the Court of Appeal disagreed and quashed his decision, affirming the constitutionality of the death penalty; but it also quashed the convictions for want of vital evidence and therefore set aside the life sentence. The court rightly commended the judge ‘for the unexcelled industry in his exploration of the human rights literature’. These recent judgements are now being studied by the new Constitutional Court in South Africa, which is considering the very same question the constitutionality of the death penalty – as its first case under the new Bill of Rights there. It is notable that Tanzania, from its relatively short experience of a Bill of Rights, is able to make such a contribution to the application of an even newer system guaranteeing human rights. In his talk Chief Justice Nyalali noted that the trend in court cases challenging the constitutionality of oppressive laws, if mishandled, ‘is bound to generate some heat’ between the judiciary on the one side and the executive and legislature on the other. The latter has responded with the Basic Rights and Duties Enforcement Act 1994, which restricts the enforcement of basic rights by requiring a bench of three High Court Judges to sit and requiring them to refer any deficient law to Parliament for amendment, instead of immediately declaring the law to be void. The question has already been raised whether this act itself infringes the basic rights explicitly guaranteed by the constitution. It seems strange that these voracious human predators are not exterminated, indeed they seem to be flourishing at the expense of the local population. According to local beliefs not all people are susceptible to crocodile attack. From long ago certain crocodiles have been fed meat and deliberately tamed for service. This ‘service’ has included transporting their ‘owners’ across the river in times of floods. However, more sinister activities are also attributed to the tamed beasts. At one point the Pangani River is punctuated by five small islands. Crocodile Owners are reputed to frequent these islands employing their animals as procurers of women. Hapless ladies brought by the crocodiles would undoubtedly be in no state to resist demands placed upon them. 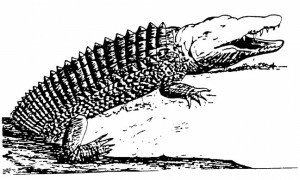 In addition, tamed crocodiles are believed to be used as assassins, disposing of enemies of their ‘owners. Crocodiles in this employ will apparently travel considerable distances from water in pursuit of their victims, even into their houses. These talented animals may be given as an inheritance to relatives or, particularly after any misbehaviour, they may be slaughtered for their skins. WHY HAVE CROCODILE ATTACKS INCREASED RECENTLY? Up to the 1950’s the river was clean; fish were plentiful and bathing and collecting water were relatively safe activities. Since then, overfishing, coupled with the dumping of the sisal industry’s waste products into the river, has reduced the crocodiles’ primary food supply. In addition, traditional riverine customs are no longer properly observed. Not only are cooking pots, maize cobs and offal thrown into the river, but menstruating women now visit the river, further provoking the crocodiles. Thus increasing attacks are seen as a consequence of human folly. If a person is missing and a crocodile attack is suspected, advice is sought from certain authorities, who will then consult the beast in order to determine whether they have been involved. If a body turns up in the river these men, protected by witchcraft and by local medicines applied to their bodies, will fish it out with impunity. Such medicine is available for sale and may be applied, for example, by boys collecting sand from the river’ in order to ward off attack. WHY ARE CROCODILES NOT HUNTED TO URBAN EXTINCTION? Firstly, they are viewed as a natural resource and their destruction is controlled. Secondly, over and above the difficulty that government game scouts have in obtaining ammunition and a daily wage are other ingrained beliefs which inhibit both individual and group action. Foremost of these is the real fear of witchcraft used by the ‘tamed’ crocodiles’ owners. Others believe that it is impossible to kill a ‘tamed’ crocodile. Another worry is that a crocodile’s killer will subsequently lose a son to another beast. Finally, if one is successful in hunting, it is essential to bury the crocodile’s bile in front of witnesses to avoid the possibility that others might use it as a poison. WHAT ADVICE CAN BE GIVEN TO A PERSON ATTACKED? The best defensive action is to counter-attack the animal’s eyes; indeed, most survivors presenting to the two Korogwe hospitals attribute their escape to this manoeuvre. HOW CAN CROCODILE BITES BE REDUCED IN KOROGWE? The importance of a reliable, pumped water supply in reducing risky bathing and water collection is clearly shown in the statistics for 1994. Eighteen deaths – about one a week – coincided with the failure of the town water pump. Failing this, villagers could collect water from the various bridges by using a long rope. Concerted village activity to reduce the vegetation along the river’s edge would help hunters to flush out the enemy. Lastly, the role of education in counteracting the influence of superstition cannot be over emphasised. This would reduce the pervading fear and allow crocodiles to be killed more freely. (This is an abbreviated version of an article which appeared in the British Medical Journal of 24-31 December 1994 – Ed). PENINA MLAMA – Playwright, Professor of Drama, University of Dar es Salaam. Tanzania is planning a $1 million-a-year tourism promotion campaign to make tourism its main foreign currency earner (ahead of coffee) Mr Peter Mwenguo, Director of Marketing for the Tanzania Tourist Board announced recently. Last year Tanzania received 300,000 tourists who spent some $240 million. This compares with 230,000 and $147 million the previous year. Recently published material includes a 36-page colour news quarterly, and the ‘Tantravel’ magazine. A 96-page in-flight magazine featuring the Serengeti National Park was published in cooperation with Lufthansa in January – East African. Four alleged Muslim fundamentalists have been sentenced to four years imprisonment each after being found guilty of rioting, stealing and damaging pork butcheries in Dar es Salaam – Daily News.